For you artsy-fartsy music fans who have always wanted musician Tom Waits‘ grizzled kisser gracing their coffee tables and/or book shelves, you are in luck, with a new collection of photographs by famed photographer Anton Corbijn, called “Waits/Corbijn ’77-’11”, releasing in May. 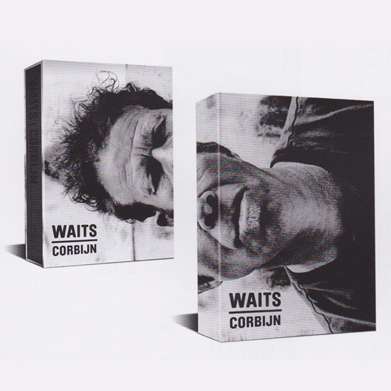 WAITS/CORBIJN ‘77-‘11, a collector’s edition linen slipcase book limited to 6,600 copies, is scheduled for a May 8th release in US and Europe by renowned German publisher Schirmer-Mosel. The coffee table art book not only features over 200 pages of Waits’ portraits taken by Corbijn over four decades, but also includes over 50 pages of the first published collection of musings and photographs taken by Waits himself. The linen bound book has introductions written by film director Jim Jarmusch, and the longtime music critic Robert Christgau. In those first photographs, then, are the seeds of these two intertwined careers, feeding off each other. Waits’ vibrant persona helped Corbijn define his narrative, cinematic style of still photography: images that felt as if you were coming in on the middle of some unfolding drama. Corbijn complimented Waits’ theatrical side in a way that synced beautifully with the experimental music he was making with Brennan. “Anton picks up a small black box, points it at you and all the leaves fall from the trees. The shadows now are long and scary, the house looks completely abandoned and I look like a handsome… undertaker. I love working with Anton, he’s someone with a real point of view. Believe me, I won’t go jumping off rocks wearing only a Dracula cape for just anyone,” Waits says. Waits’ own photography, collected here for the first time under the title “Curiosities,” gives a visual handle to the artistic intelligence millions of fans know only through his music. Waits/Corbijn ’77-‘11 is now available for pre-order, which will set you back about $200, at www.tomwaitsstore.com. New Yeah Yeah Yeahs Album Drops In April!!! The Black Keys To Perform At The Grammys! This entry was posted on Thursday, January 17th, 2013 at 7:33 pm	and is filed under Books, Music, News. You can follow any responses to this entry through the RSS 2.0 feed. You can skip to the end and leave a response. Pinging is currently not allowed. « Warner Bros. Is Trying to Reboot ‘Gremlins’!! [after hearing about Dr. Evil's Big Boy rocket, which is returning] Good God. He's back! In many ways, Bob's Big Boy never left, sir. He's always offered the same high-quality meals at competitive prices.